Climate change affects every human around the globe, with profound implications for economic opportunity, social justice, and human rights. Health-related stresses; competition for natural resources; and the impacts on livelihoods, hunger, and migration warrant immediate global action. Indeed, rising attention to climate change coincides with fundamental changes in technology, the nature of employment, and the social contract. Only by considering these issues together can we develop effective solutions. This report examines the concept of the “just transition” to the low-carbon, climate-resilient economy. It provides recommendations for business on how to reduce greenhouse gas (GHG) emissions, while enabling economic vitality and ensuring adherence to global labor standards; how to enhance climate resilience for communities; and how to cultivate effective participation in the social dialogue, which will accelerate such a transition. This report is part of a series of six climate nexus reports that cover just transition, human rights, inclusive economy, women’s empowerment, supply chain, and health. The Paris Agreement on climate change requires a transition to a net-zero GHG economy in the second half of this century. By recognizing the need for “a just transition of the workforce and the creation of decent work and quality jobs,” it acknowledges that the shift to a clean-energy economy is disruptive for some people and communities, in spite of the profound shared benefits of a low-carbon energy system. The OECD estimates that a decisive transition package could boost long-run output by 5% across the G20 countries by 2050. Individual companies that implement a just transition will better manage the risks from a transition to the low-carbon economy and capitalize on related opportunities. Potential labor law violations and related legal action. Misalignment with future increases in carbon price. Increased cost of retraining or hiring plans due to technological shifts. Reduced knowledge and insight from lack of consultation. Increased cost of tackling market risks reactively. Negative impacts to worker recruitment and retention and/or brand and customer perception. Most studies indicate that climate policies can result in net employment gains of 0.5–2 percent, or 15–60 million jobs globally, with the ILO estimating a net increase of 18 million jobs. Help shape regulations and legal reforms with governments and unions. Grasp new commercial and technical opportunities through reskilling and retraining. Increase employee productivity, creativity, and flexibility through good workforce relations. Facilitate adjustments in wages and working time through the implementation of social dialogue. Improve customer loyalty and brand recognition. Improve their social license to operate with the creation of green jobs. Enel, an Italian electricity company operating in more than 30 countries, committed to decarbonize its energy mix by 2050. To implement this commitment—which includes the closure of 13 gigawatts of thermal power stations in Italy, as well as the expansion of renewable energyEnel engaged workers, unions, local government, business, and communities to develop plans for new economic development post-closure. A commitment to respecting human rights and fair labor practices. Apprenticeships to transfer knowledge from elderly to young workers. A commitment to retention, retraining, and redeployment. Early pension for older workers. Business can make an invaluable contribution to the just transition. 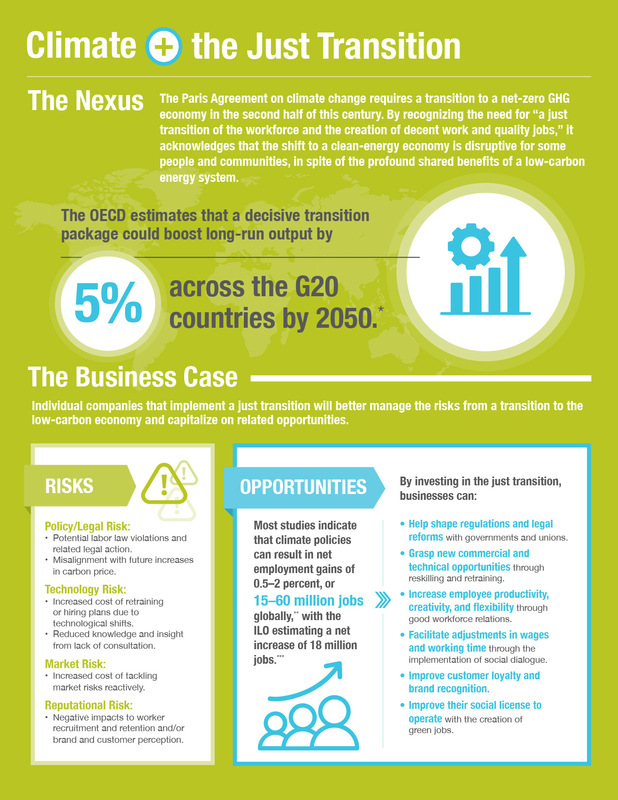 Businesses can act within their own operations through assessing and disclosing climate risks and opportunities. This includes disclosing the risk of economic and employment dislocation; committing to jobs that are green and decent; and procuring renewable energy in accordance with human rights and labor standards. 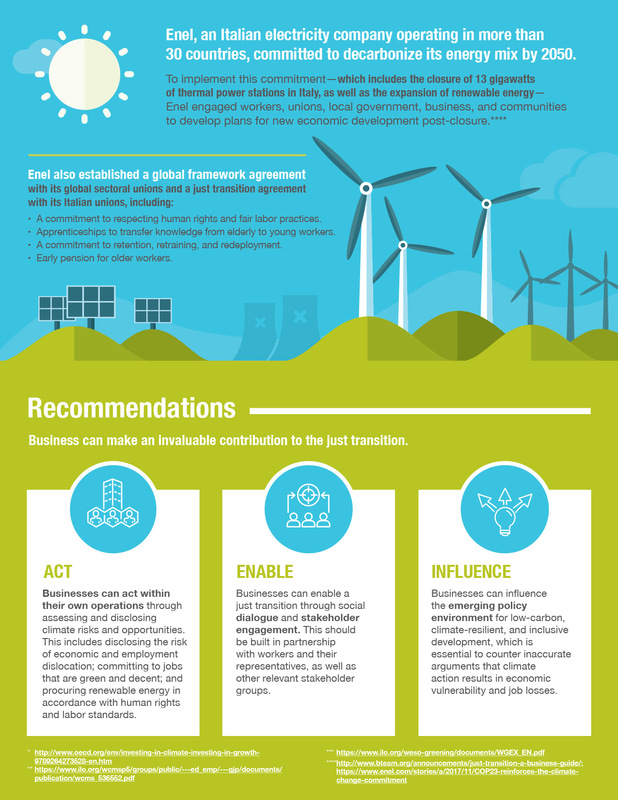 Businesses can enable a just transition through social dialogue and stakeholder engagement. This should be built in partnership with workers and their representatives, as well as other relevant stakeholder groups. Businesses can influence the emerging policy environment for low-carbon, climate-resilient, and inclusive development, which is essential to counter inaccurate arguments that climate action results in economic vulnerability and job losses.